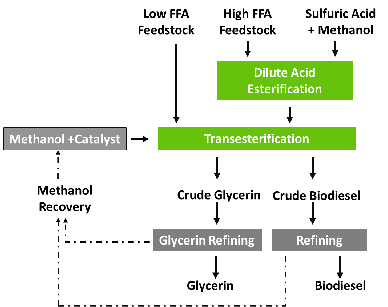 Biodiesel producers often utilize lower cost feedstocks (e.g. recycled cooking oils, waste corn oil, yellow grease, animal fats, etc…) and next generation feedstocks (e.g. Jatropha, algae oils) containing high concentrations of free fatty acids (FFAs) to reduce input costs. Most commercial systems require the removal of FFAs (<0.1%) before conversation of the oil to biodiesel. FFAs react with the high concentrations of base catalyst used in conventional systems to form soaps. Soaps can trap biodiesel during separation of the glycerin thereby reducing overall process yields. The pre-treatment of high FFA feedstocks is an extremely costly process. In addition, the capital costs associated with pre-treatment can add up to 50% to the cost of a plant. BDR’s membrane reactor can process feedstocks up to 5% FFA without pre-treatment. Most conventional continuous flow production systems use two or more batch reactors (large pressure vessels with mixing) in series with removal of the crude glycerin phase and the addition of additional methanol and catalyst in between to help drive the reaction as far to completion as possible. Feedstocks like recycled cooking oils contain high concentrations of free fatty acids (FFAs) and require pre-treatment (e.g. acid esterification) before conversion of the oil to biodiesel. After the transesterification step is complete, the reaction mixture is neutralized and then cooled. The glycerine will form a separate phase and is separated from the biodiesel using settling tanks coalescors or centrifuges. Significant downstream refining (e.g. water washing, distillation, etc.) of the biodiesel product must still be performed in order to meet ASTM/EN standards. The extent of purification required is in part dependent on the quality of the starting materials, the percent conversation and the presence or absence of minor constituents (e.g. sterol glucosides).